Unfortunately the mapping of certificates wasn’t quite as good as most of us were expecting. On the plus side, Marriott has announced some positive updates regarding this, which I consider to be good news (at least compared to what we initially thought). Initially Marriott said that you wouldn’t be able to redeem existing Travel Package certificates until September 18, 2018. This one month period where you couldn’t redeem was supposedly due to potential issues Marriott was worried they’d have with their new technology. As it turns out that isn’t an issue and they’ve completed the testing necessary. As a result you’ll be able to redeem existing Travel Package certificates starting today. 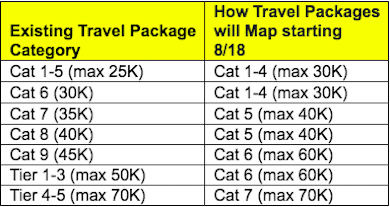 Members who booked a Category 6, Category 8, or Tier 1-3 Travel Package can receive a one-time exchange for a package one category lower. The reason this is being done for these categories is because in all cases you’d get the same value if you had booked a hotel that’s one category lower, so as a gesture of goodwill Marriott will refund 30,000 points per certificate for those who request it. This one-time exchange can be requested by contacting Marriott at this link, and selecting the “packages – deals” topic. You actually have until these certificates expire in order to exchange them, and once you do, the certificates will once again be valid for a year, so you can potentially make that work in your favor. With Marriott Travel Packages you’ve always been able to exchange your certificate for a set number of points, and this will continue to be possible for existing certificates issued prior to August 18, at the same rates as before. Category 1-5 certificates can be traded for 45,000 points, and higher level certificates can be traded for 45,000 points plus the difference in cost between certificates. In other words, if you had a Category 9 Certificate you could elect to get 165,000 Marriott points back (the 120,000 point difference between Categories 1-5 and Category 9, plus 45,000 points). This is an option that many might be interested in. To unbundle the math even further, this would be the equivalent of having redeemed 75,000 Starpoints or 225,000 Marriott Rewards points for 120,000 airline miles, which I’d consider to be pretty good. While Marriott Travel Packages haven’t worked out as well as I had (perhaps optimistically) thought, these are at least positive developments. With these developments you’ll at least get 30,000 points back if you booked one of three types of packages, and in the process you’ll be able to extend the expiration of your certificate as well. It’s also nice that the one month “freeze” isn’t actually happening. In light of these developments, what do you plan on doing with your Marriott Travel Packages?